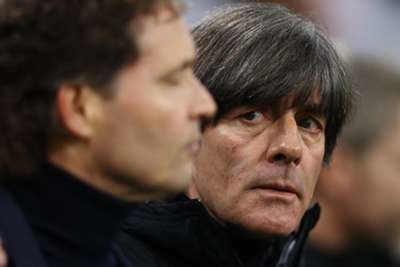 Joachim Low was left "very satisfied" after Germany started their Euro 2020 qualifying campaign with a 3-2 win over Netherlands. Nico Schulz's 90th-minute goal saw Low's men to victory in the Group C clash in Amsterdam on Sunday. After a difficult 2018 that led to questions over his position as coach, Low said he had moved on from the tough year. Asked if he was happy, Low said: "I am very satisfied. "I personally feel very good. I do not think about the old year anymore, I went through it. "We had good moments during the last games already. I had this good feeling before the game already because in France and at home against Netherlands we were playing well too but weren't rewarded." Leroy Sane and Serge Gnabry had put Germany in control before the hosts responded in the second half, drawing level through Matthijs de Ligt and Memphis Depay, only for Schulz to deliver the winner. Low explained his decision to start with Sane, Gnabry and Leon Goretzka in attack. "We wanted to attack with three players. With Leroy, Serge and Leon that we attack their four defenders and [Frenkie] de Jong too," he said. "We wanted these three guys to play very close together and show a variable playing style with changing positions a lot. "It was not about playing with two forwards but more with three who are playing offensively together and find spaces."